In order for institutions to institute a military industrial complex, a prison industrial complex, a pharmacological industrial complex and so on, humanity had to become disconnected from its unseen reality. Whether ethereal or too small to fathom, we have been conditioned over time to disbelieve in the unseen, to trust only 5 of our senses, and to prize rational logic (which cannot itself perceive the unseen) over intuition. Then, with only ‘the seen’ at front of the collective mind, the unseen dangers of nuclear industry experimentation have become whitewashed in public discussion, and radiation monitors disabled by government, while unprecedented levels of radioactivity poisons our only world. It is an inarguable fact that nuclear radiation and life on our planet cannot co-exist in the same space. It is another inarguable fact that nuclear radiation takes hundreds of thousands of years to break down, creating life-threatening environmental conditions not just today, but for seven thousand generations to come. 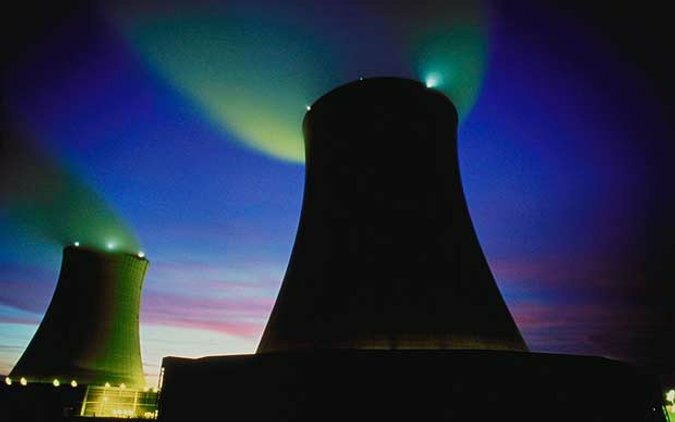 Yet, despite the industry’s inability to avoid total meltdowns every few years, nuke advocates continue to espouse nuclear as a “safe” energy alternative, employing a program of pseudo-science to confuse the logical minds of humanity, creating the scene for these dangerous yet financially profitable (to some) practices to continue. Many pro-nukers even go so far as to suggest that ‘low dose’ nuclear radiation is somehow good for us! But understand, this theory – known as the “Hormesis Effect” – is deliberate industry quackery, and anyone who tells you radiation is good for you is either an industry stooge, or has been conned by one. It has been well proven through both science and history that the human body (correctly) perceives radiation as a threat to its existence. If you don’t believe this premise, ask the good folks of Chernobyl, Hanford, Three Mile Island, and Fukushima (among myriad others). The external threat of radiation sends the human body’s immune response into overdrive. The short term result of this intense immune activity can be the improvement of other existing ailments, but our immune systems are not designed to run permanently in this state of stress so, as radiation exposure continues, health inevitably deteriorates. 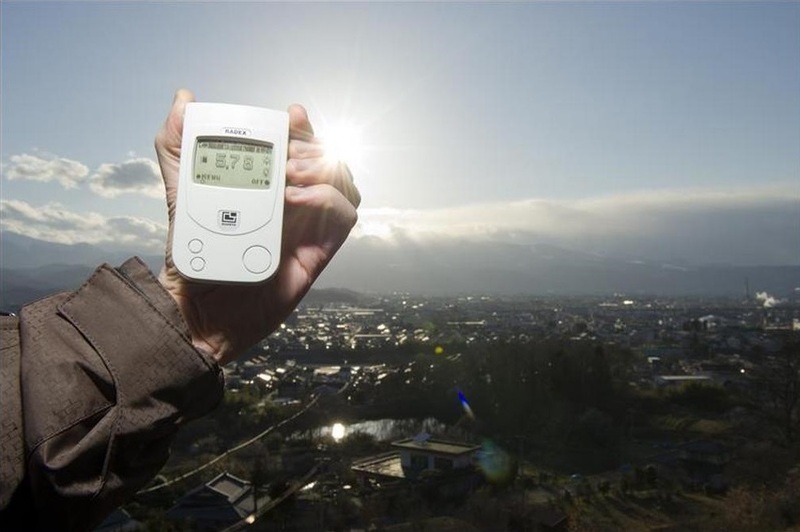 A Greenpeace team member holding a Geiger counter displaying radiation levels of 5.78 microsievert per hour outside Fukushima city on March 27, 2011. Radiation levels far exceed exposure limits considered “safe” for the 400,000 strong human population below. Children exposed to Chernobyl fallout were experiencing chronic adult diseases of the respiratory and blood systems, gastritis, nervous system diseases, cardiovascular diseases and other diseases of internal organs. In general, in 1991, the level of serious illness in children was about 6 to 7 times above normal. In reality, no one on this planet would engage in nuclear experimentation if they valued the unseen, the spiritual and the ethereal. No one would engage in nuclear experimentation if they practised the Rule of Seven Generations. No one would engage in nuclear experimentation if they valued life on Earth over unnecessary toxic energy systems and destructive devices of war. We digress from our hypothesis, but feel it’s important to note how the following problem was allowed to occur — by the transformation of our collective mind state from a culture rooted in localized permaculture and sustainable practices into a barbarous war culture that knowingly poisons its environment in the name of energy and armory, and then wonders why ill health is so prevalent. It is also important to point out that nuclear experimentation knows no borders; it negatively impacts all life, and destroys entire sections of our planet’s interconnected ecosystem. Nuclear experimentation is therefore not a means to self-support, or self-defense, but an attack on everything — on life itself. There have been 2,000 atomic and nuclear detonations on every strata of earth since the first experiment in New Mexico, July, 1945 and the two most infamous devices dropped on Hiroshima and Nagasaki later that summer. That makes 70 years of radiological contaminationfrom nuclear detonation experiments alone, each one inevitably releasing billions of atomic echoes we cannot comprehend entirely. The Manhattan Project scientists actually debated amongst themselves whether or not the detonation would cause a chain reaction igniting the entire atmosphere, but did it anyway. After the blast there was a radiated ‘blast zone’, an area destroyed forever, and also radioactive fallout that fell well beyond the designated blast zone; deadly dust kicked up by, and elements formed in, the detonations. a) Radioactive particles that are carried into the atmosphere after a nuclear explosion and gradually fall back as dust or in precipitation. b) The adverse results of a situation or action. What is not realized about this definition is that not all of that nuclear garbage actually ‘falls out’. Some of the dust and radioactive elements are so light that they do not actually fall out but remain in our atmosphere, dramatically altering its complexion. In fact the airborne radioactive waste from the era of nuclear detonation experiments has only now saturated the atmosphere, and spread out evenly. Meanwhile, the radiation that does fall from the atmosphere does not break down, but accumulates in soil and water, poisoning everything it touches in perpetuity. Meanwhile, the ongoing Fukushima disaster could further increase the problem of atmospheric contamination by continuing to spew radiation into the sea. 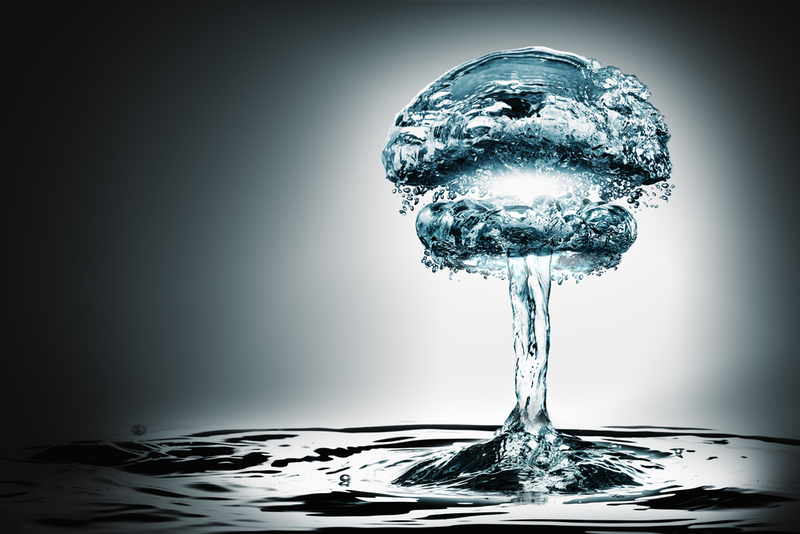 When radioactive material hits the minerals in sea water, it creates a chemical reaction. Ultimately these elements may trigger so many reactions that they become nano sized particles, and when this occurs, the elements then mingle with all other elements, upsetting the natural balance of nature. And again, the cycle continues, with some radiation falling out (through precipitation) into soil and water and some remaining in the atmosphere, where it will continue to cycle through our ecosystem for millennia – with disastrous affect. 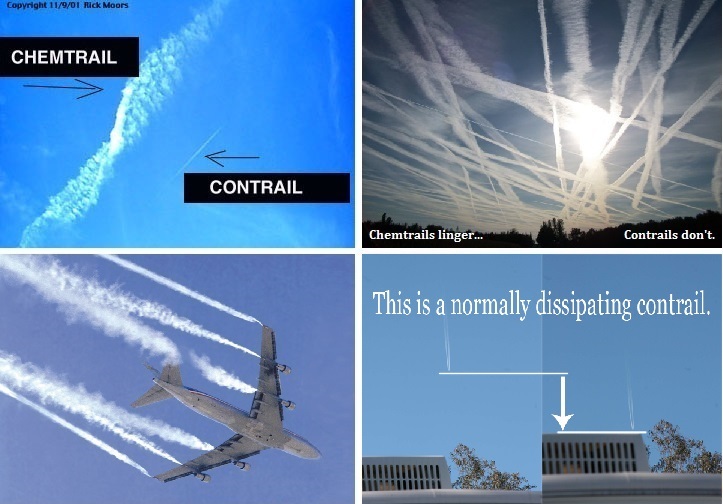 Geoengineering (including chemical spraying practices known colloquially as “Chemtrails”) refers to the stratospheric aerosol (SAG) spraying programs which inject highly toxic chemicals and vast quantities of heavy metals into the Earth’s atmosphere. Although this program is not publicly discussed by government and military, overwhelming evidence has been gathered by independent researchers the world over, which thoroughly documents the means through which global weather patterns are deliberately being manipulated. In 1996, a research paper, dangerously entitled “Weather as a Force Multiplier: Owning the Weather by 2025” was presented to the United States Air Force “to comply with a directive from the chief of staff of the Air Force”. It explicitly outlines that the government’s motivation to engage in global weather modification practices (quaintly titled “geoengineering”) is “to remain the dominant air and space force in the future”, built on the premise that if you control weather conditions, you better control the population. 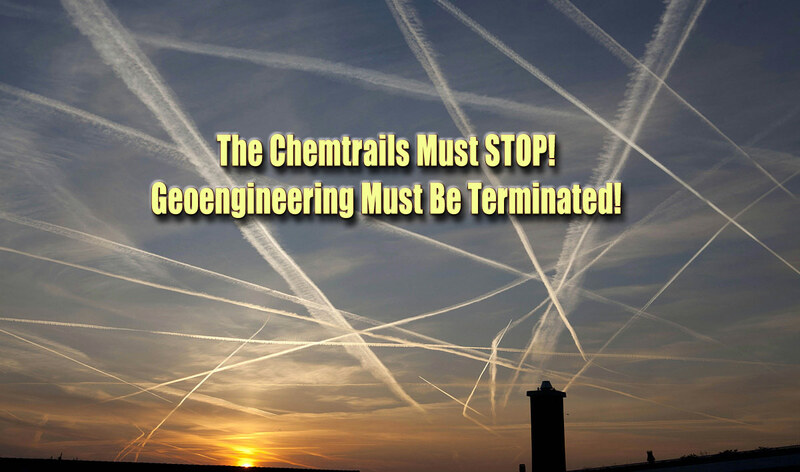 The geoengineering program is no more than a military “force multiplier”, developed at our expense and without our consent, by the world’s political and financial elite to further the agenda of global control. But when it comes to weather modification and nuclear programs, that sense of “control” is a dangerous illusion. The untold effects of chemical spraying on human and environmental health mirror those of the failing nuclear experiment, while the cumulative damage created by both programs is potentially exponential. Meanwhile, institutional rhetoric and a deliberate public culture of ignorance dominate discussion of this issue (we can already hear the mindless chanting of the old “tin foil hats” chestnut) continues to serve this agenda. When the public is poorly educated, their minds are easily controlled – through fear and belittlement of the truth. This tactic has been successfully employed by complacency theorists for centuries. How much more do you want to be deceived? Thankfully, the scientific community isn’t just bending over and accepting these dangerous lies. An expert in his field, Mangels attributes pH over 10-times the alkalinity of normal soil on huge increases of aluminum oxide. ← Why is lithium being used in chemical geoengineering program over Oregon?